Continuing on our Queen of Green theme that we started in the spring, here’s a new initiative! It’s called the Better Back to School Brigade. Here’s our advice for week 2: School Supplies! Back-to-school spending is now the second biggest consumer spending season with shoppers buying everything from clothing to pencils to calculators. In 2010, there were over an estimated 5 million elementary and secondary students and nearly 2 million post-secondary students enrolled in Canadian schools. Consumers spent $123 million on school supplies and $206 million on textbooks. These figures were only expected to rise over the next several years. Host a clothing swap with some friends who have older kids than you. Maybe you can get some awesome back to school outfits for your child and your friend can get one of your purses that you don’t use anymore. Everyone wins and it’s free! If mall shopping is still an important part of your back-to-school ritual then shop ethically and consult the Good Guide for the most socially and environmentally conscious clothing brands. And, here’s a PDF that outlines how to stay PVC free when it comes to school supplies: PVCfree. Share your ideas with us too for how to make back-to-school better. 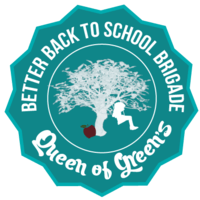 The David Suzuki Foundation has some awesome eco-friendly prizes to give away as part of the Better Back-to-School Brigade and also check out the Queen of Green’s Facebook page for more posts about everything green. Bonus! Here’s another prize giveaway!